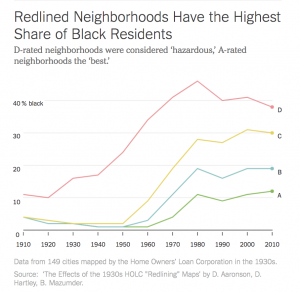 More evidence that today’s segregated America didn’t just happen out of individual choices and preferences. 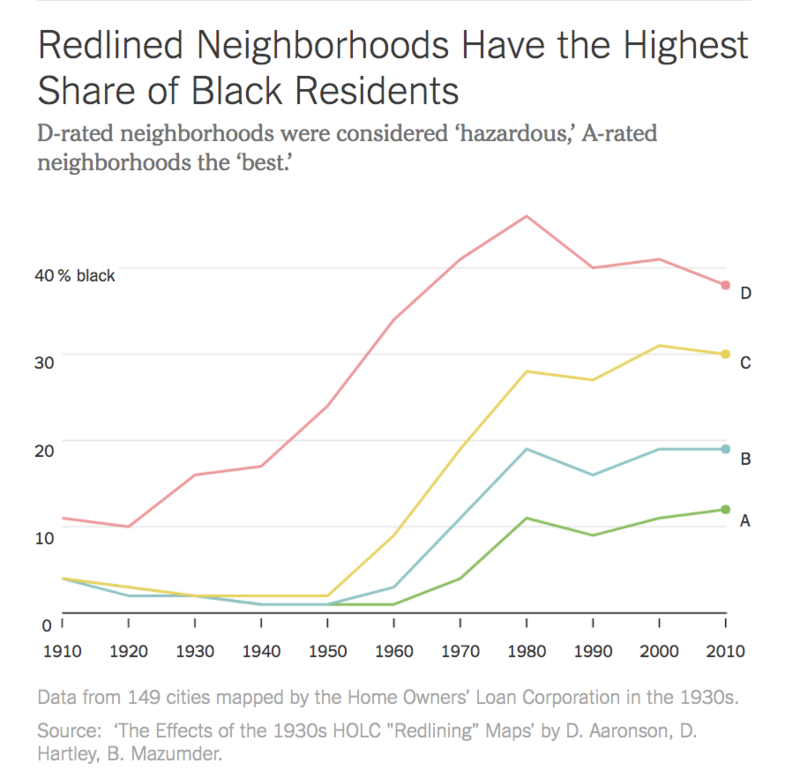 The 8/24/2017 NYTimes article, “How Redlining’s Racist Effects Lasted for Decades” by Emily Badger reviewed research by economists from the Chicago Federal Reserve that demonstrate the impact of the 1930s redlining of neighborhoods by the Home Owners’ Loan Corp, a New Deal housing agency, has had long term effects of segregating people. 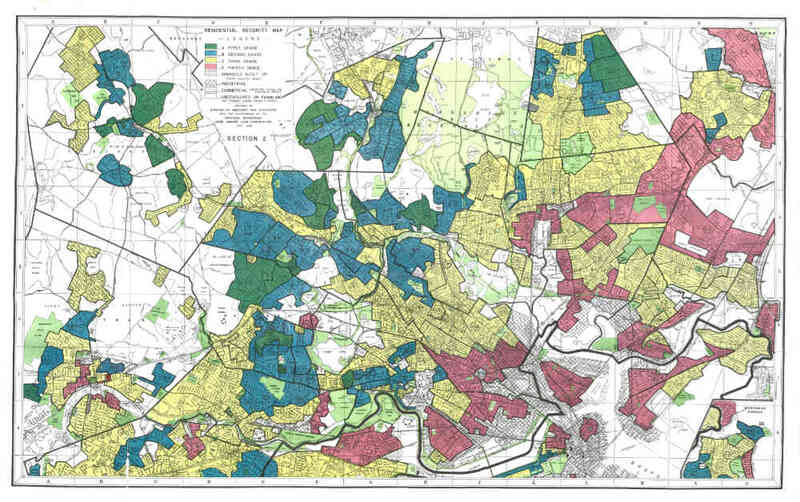 1 The HOLC maps are available here at the University of Richmond Digital Scholarship Lab. Look up your favorite city. Aronson, Daniel, Daniel Hartley, and Bash Mazumder. 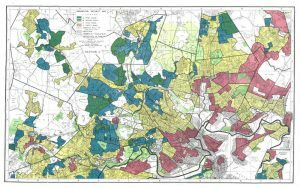 “The Effects of the 1930s HOLC ‘Redlining’ Maps – Federal Reserve Bank of Chicago.” Working Paper, Federal Reserve Bank of Chicago No. 2017-12, 2017. Accessed August 29, 2017. https://www.chicagofed.org/publications/working-papers/2017/wp2017-12. Are we to assume the color scheme from the graph correspond to the color schemes in the two maps? The maps are not quite legible. The chart is a NYTimes summary of data. Recent. 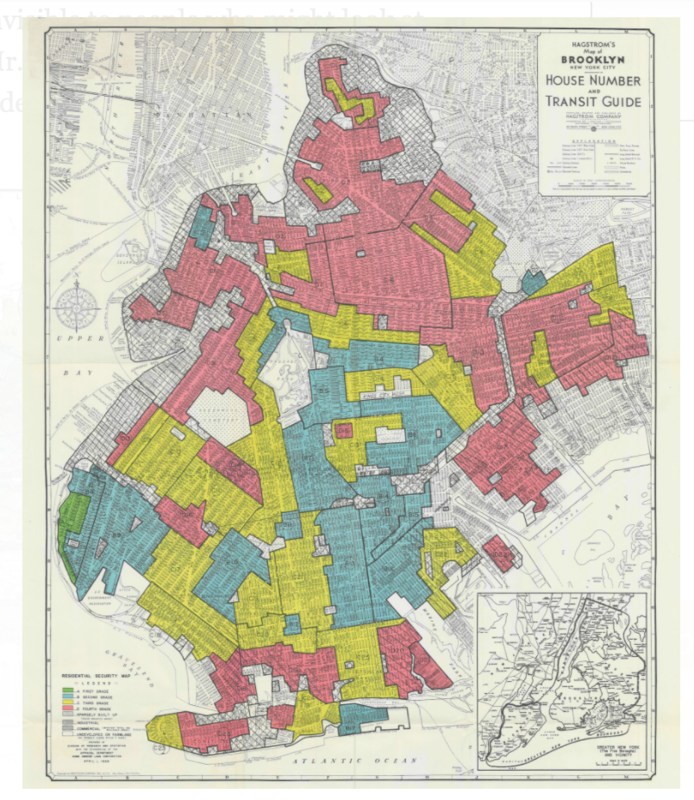 The maps are original maps from How Owners’ Loan Corp in the 1930s. According to the U. Richmond website the colors indicate as follows: green= A “Best”; blue= B “still desirable”; yellow= C “definitely declining”; red= D “Hazardous”. Go to the HOLC link at U Richmond embedded above to look in more details at full scale. 1. ↥ Rothstein, Richard. 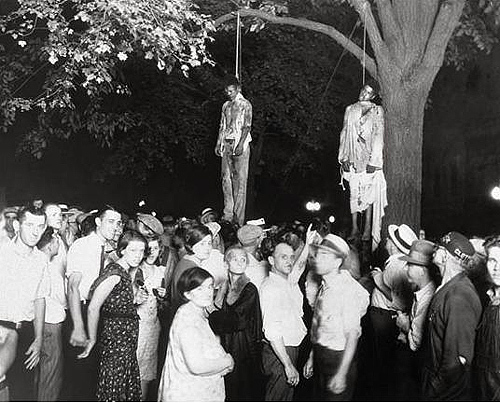 Color of Law: A Forgotten History of How Our Government Segregated America. Liveright Publishing Corporation, 2017.